Ice cream. Such a nice summer treat. In my head when I explain what type of ice cream I like I talk first about my favourite flavours, so when I was smaller I loved flavours like chocolate, walnuts, pistachios. Now I’m more into basic – vanilla or strawberries will do, although in Italy I’ve learnt I still enjoy chocolate ones, they just need be done well. I like unusual flavours like violets, lavender, rose (I tried them in Antwerp), or sea salt, brown bread from Murphys. The reason I focus on flavours is just that proper ice cream come as scooped ice cream, aren’t they? Yes, there are 99s, they are actually called Italian ice cream in Poland, but they are soo not Italian, and I liked them only from one place and it doesn’t exists anymore. And then the last ones come store-bought ice cream, that I’ve never paid too much attention, I would divide them into ice cream on a stick, cornettos, sandwiches, ice creams in a cup and water-based ice-creams. So whenever at work we go for ice cream after lunch I feel lost. There are not too many gelaterias in Ireland, so we go to a shop and on the way there I hear these names that make me think about superheroes, but they don’t really mean anything, they just sound funny. So I go to the shop and try an ice cream with a funny name to try better understand my Irish friends, but then at home I make my own ice cream and they are so much better, even though they are cheat ice cream, that only require blending. 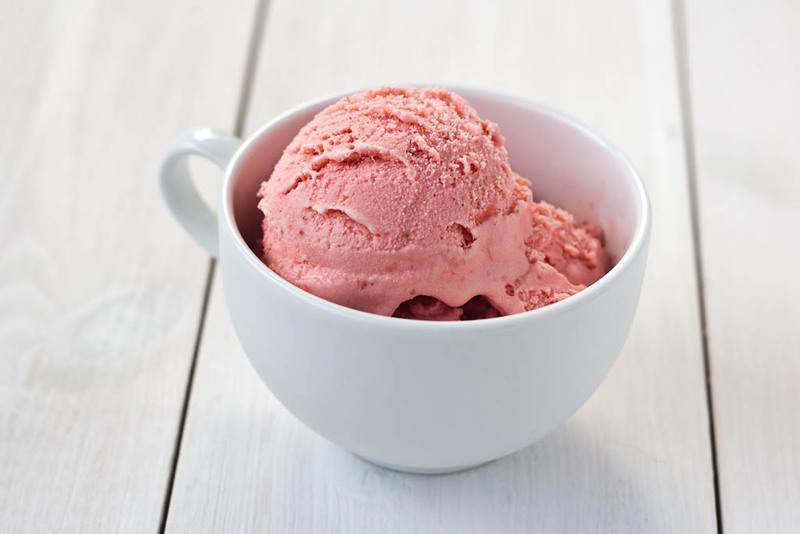 So today we have strawberry ice cream. As you can see I have a quality control assistant. It’s tough to meet his standards, but he accepted the ice cream in the end. My usage of dairy was driven by the fridge content, you can use a different ratio of creams, milk, yogurt you like to, just keep the total amount the same. If you will use more yogurt or sour cream remember to add more sugar. The more double cream you add, the more creamy ice cream will get. Slice the strawberries, mix it with honey, sugar, and vodka or kirsch and leave it covered for an hour stirring from time to time. Put strawberry mixture, sour cream, double cream, yogurt and lemon juice into a blender and blend it until almost smooth. It’s up to you how big chunks of strawberries bits you want to see. If possible refrigerate for 1 hour and then put it into your ice cream maker and follow the manufacturer’s instructions. Posted in Ice cream, Summer and tagged brown sugar, double cream, honey, kirsch, lemon juice, sour cream, strawberries, yoghurt. Bookmark the permalink.